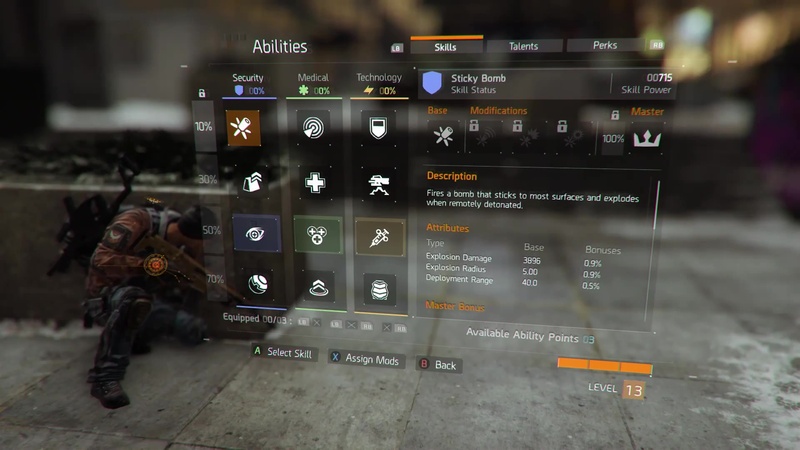 The ability system in The Division compensates for the nonexistent character classes and is divided into the three main sections Skills, Talents and Perks. Each section allows you to customize countless options, which means that you can pretty much create your own class based on your needs and preferences. You can always reassign and reset your abilities on the fly, which makes trying different builds even more comfortable. Want to learn more about them? You can either follow the links below or jump in right into our interactive The Division Skill Calculator. Offensive and defensive abilities/gadgets are waiting to be mastered by you. Provide a unique combat enhancement triggered through defined activities. Modifiers that passively affect your gameplay without player interaction.